Apr 12 (OPTA) - Scoreboard at close of play of 2nd odi between Zimbabwe and United Arab Emirates on Friday at Harare, Zimbabwe Zimbabwe win by 4 runs (DLS Method) United Arab Emirates 1st innings..
▶ Videos for "2nd Odi"
Mar 24 (OPTA) - Scoreboard at close of play of 2nd odi between Pakistan and Australia on Sunday at Sharjah, United Arab Emirates Australia win by 8 wickets Pakistan 1st innings Imam ul-Haq b Jhye..
Mar 6 (OPTA) - Scoreboard at close of play of 2nd odi between South Africa and Sri Lanka on Wednesday at Centurion, South Africa South Africa win by 113 runs South Africa 1st innings Quinton de Kock c..
Live Cricket Score: South Africa are looking to carry the momentum of their win in the 2nd ODI after defeating Sri Lanka in the 1st ODI. 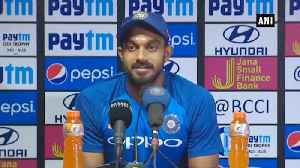 Sri Lankan opening pair had failed to deliver in the 1st game..
Vijay Shankar may have brightened his World Cup chances but he is not thinking on those lines right now. Indian bowlers delivered in a heart-stopping climax to fashion a narrow eight-run victory against Australia in the second ODI after skipper Virat Kohli conjured up a resolute hundred in testing..
Mar 5 (OPTA) - Scoreboard at close of play of 2nd odi between India and Australia on Tuesday at Nagpur, India India win by 8 runs India 1st innings Rohit Sharma c Adam Zampa b Pat Cummins 0 Shikhar.. Despite skipper Virat Kohli's brilliant century and a disciplined innings from Vijay Shankar, India were bowled out for 250 against Australia in the second One Day International (ODI), in Nagpur. Ravindra Jadeja joined an elite list of Indian all-rounders during India vs Australia 2nd ODI in Nagpur. The Indian skipper led from the front in the second ODI vs Australia, scoring his 40th ODI century off 107 balls in Nagpur on Tuesday. After being sent in to bat, Kohli came out to the crease following..
India will look to continue their momentum while Australia will look to bounce back when the two sides face each other in the second ODI in Nagpur on Tuesday. Virat Kohli has been in a good mood after winning the first ODI match against Australia in Hyderabad. Ahead of the second ODI in Nagpur, the Indian skipper was caught on camera enjoying the practice..
With the nets session in full flow, Virat Kohli and his men sweated it out under the blazing Nagpur sun. The Virat Kohli-led team ticked all the boxes in their opening win of the series Australia on Saturday. Australia and India will meet for the second ODI of the five-match series on March 5 in Nagpur. The Indian chase did not enjoy the best of starts with opener Jemimah Rodrigues dismissed for a duck. Indian women's team defeated England by seven wickets in the second ODI to take an unassailable 2-0 lead in the three-match series here Monday. Indian captain Mithali Raj Sunday urged her team-mates to "work on partnerships" as they looked to claim an unassailable lead in the three-match ODI series against England. The Indian women cricket team defeated current world champions England by 66 runs in the opener at the Wankhede Stadium on Friday. The Women in Blue, who have taken an unassailable 2-0 lead in the series, will now play a dead-rubber clash against New Zealand on February 1 at Seddon Park in Hamilton. The Indian women bowled New Zealand out for a paltry 161 in their second One-Day International (ODI) in Mount Maunganui on Tuesday.